ATVs, quads, 3-wheelers, 4-wheelers are popular among teens and adults. They can be fun and functional. Recreational riding, hauling heavy objects, off-road transportation, hunting are among the many uses of all-terrain vehicles (ATvs). Adults as well as teens and children can be found riding and operating ATVs. Even when operated properly, ATVs are incredibly dangerous and can lead to accidents and serious injuries. In 2014 alone, the U.S. Consumer Product Safety Commission estimates that there are over 93,000 ATV-related injuries. Twenty-five percent were for kids under the age of 16. 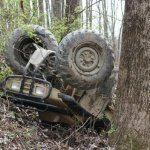 The biggest contributing factors in most ATV accidents are driver inexperience and alcohol or drug use. Inexperienced riders are 13x more likely to cause an ATV accident in their first month in comparison to a more seasoned rider. Drug and alcohol use is involved in 30% of all ATV crashes. ATV accidents are treated the same as car wrecks. DUI/DWI laws apply to ATV incidents. Inexperienced drivers have a much greater risk of injury or death. Training courses are available and suggested. Training classes are beneficial in learning the skills needed to safely drive an ATV. Drinking alcohol, using drugs, night driving, driving on paved streets, and speeding make an accident more likely. Safety precautions are important when using an ATV. Proper safety could mean the difference between an accident and a fun time. • Only one person should ride an ATV at the same time. • Become familiar with the operation of the vehicle. Read all guidelines and literature. • Thoroughly inspect the vehicle before operation. • Wear proper clothing and safety equipment when riding. The majority of ATV accidents are caused by driver error, however some ATV accidents are caused by defective machinery. Defective ATVs have manufacturing flaws. If the manufacturer is aware of a safety hazard and does not warn the public, they are guilty of “failure to warn”. Design defects can be minor and irrelevant. However some errors in the product design that make the vehicle dangerous to operate and unsafe. Hundreds of thousands of ATVs are recalled due to design flaws. Depending on the defect there have been product lawsuits against ATV manufacturers. The personal injury attorneys at the Law Offices of L. Clayton Burgess has experience dealing with accidents that involve All-Terrain Vehicles (ATVs), or motor scooters such as Vespas and Mopeds. If you have been injured or a loved one has been killed due to a sport vehicle accident, you need an attorney. Clay Burgess has a team of dedicated and experienced attorneys that will fight for the highest possible compensation for you. Our attorneys represent those who have suffered a loss or disability through an ATV, recreational vehicle or sport vehicle accident. These cases can be challenging, and sometimes very difficult difficult, to pursue. Almost always the insurance company will allege comparative fault or negligence against the accident victim. You need an experienced personal injury attorney who can successfully defeat the insurance company’s claims of negligence either in court or before a lawsuit is ever necessary. Our accident and injury lawyers can help.